The BMJ’s first open data campaign aimed to pressure companies into releasing the underlying clinical trial data for two globally stockpiled anti-influenza drugs, Tamiflu and Relenza. The campaign lasted nearly 4 years and was ultimately successful, and helped galvanize a movement towards increased transparency of clinical trial data. The BMJ’s campaign facilitated the first ever Cochrane review based entirely on clinical study reports and regulatory data. The BMJ’s campaign led to changes in transparency by pharmaceutical companies and triggered inquiries at the national and international level. The BMJ’s campaign heightened awareness of the importance of independent access to underlying trial data, in particular highlighting important discrepancies between journal publications and underlying clinical study reports. Since the mid-2000s, governments have spent billions of pounds stockpiling two anti-influenza drugs, the neuraminidase inhibitors oseltamivir (Tamiflu) and zanamivir (Relenza). 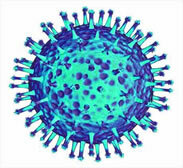 When the so-called “swine flu” H1N1 influenza emerged in 2009, the UK and Australian governments commissioned a rapid update of an existing Cochrane review of the drugs. As the review team began its work, it received an unexpected criticism and challenge by Keiji Hayashi, a Japanese pediatrician. Hayashi pointed out that the key piece of evidence underpinning the previous Cochrane review’s conclusion--that Tamiflu reduced the risk of secondary complications such as pneumonia--was based on a manufacturer-authored, pooled analysis of 10 manufacturer-funded trials, 8 of which were unpublished. The Cochrane team set out to respond to Hayashi’s challenge by requesting the unseen trials. Despite the urgency of the situation, however, the reviewers were met with major challenges, as documented in a 2009 BMJ investigation by Deborah Cohen. told in this BMJ article published in December 2009). On December 8 2009, Roche publicly promised in a statement printed in The BMJ, to release full study reports to doctors and scientists. But the Cochrane group’s efforts to obtain the promised full clinical study reports were met with numerous refusals. The BMJ launched its first open data campaign to help ensure access to these data for independent scrutiny. The campaign was based on a key decision to support transparent and accountable analyses and decision making by opposing closed doors and confidentiality clauses. In 2012, The BMJ intensified its efforts and began using open correspondence as a means of holding specific individuals and organisations to account. Open letters published in The BMJ aimed at (and sometimes achieved) a public response--for example, to NICE (response here) and Roche. And streams of letters published on bmj.com--mostly between the Cochrane researchers and Roche, GSK, WHO, CDC, EMA, and NICE (institutions which which manufactured, licensed, and promoted the drugs)--offers readers the chance to witness attempts to compel greater accountability and responsibility in public health decision making and policy. This was a new tactic that seems to have been successful. WHO was recommending Tamiflu but had not vetted the underlying data. EMA approved Tamiflu, but had not vetted the underlying data. CDC was encouraging the use and stockpiling of Tamiflu on the basis of the 6-page manufacturer funded pooled analysis of 10 clinical trials, but had not vetted the underlying data. The majority of Roche's Phase III treatment trials were unpublished a decade after completion. The above facts all remain true today (as of February 2019). By October 2013, almost 4 years after Roche’s original promise, the Cochrane reviewers had finally received full Clinical Study Reports (CSRs) for 107 studies from the EMA, GSK and Roche (around 150,000 pages), which formed the basis for the latest Cochrane review update published in April 2014 in the Cochrane Library and, in shortened form, in two articles in The BMJ. The reviewers concluded that there was no convincing trial evidence that Tamiflu affected influenza complications (in treatment) or influenza infections (in prophylaxis), and raised new questions about the drug’s harms profile. In addition to the review and the open correspondence, the Cochrane team made the complete set of 107 full clinical study reports publicly available and The BMJ published all peer reviewers’ comments from 2009, making it possibly the best documented and most transparent review ever undertaken--and certainly the first Cochrane review to use a full regulatory dataset. BMJ’s open data campaign and the Cochrane review raising questions about Tamiflu led some governments to question their policies. In the UK, the Public Accounts Committee put Tamiflu stockpiling and access to clinical trial data on center stage. BMJ editor in chief Fiona Godlee testified before the Committee, and the House of Commons issued a report calling for greater transparency. At the European level, the Council of Europe held hearings in 2010 that questioned the appropriateness and transparency of governmental decision making with respect to H1N1 influenza. Calling for more transparency, the Council questioned the sufficiency of the scientific evidence base to justify governments’ use of pandemic vaccines and antivirals. At the first hearing in January 2010, the WHO defended itself against accusations of conflict of interest. “Let me state clearly for the record. The influenza pandemic policies and responses recommended and taken by WHO were not improperly influenced by the pharmaceutical industry.” In response to the Council of Europe and BMJ investigation, WHO again defended itself but vowed to tighten its procedures. But months later, another BMJ investigation reported that scientists advising the WHO on its pandemic planning had done paid work for influenza antiviral manufacturers--conflicts of interest that WHO had not publicly disclosed. The campaign for Tamiflu data also help galvanize the efforts of those campaigning for greater transparency of all clinical trials. Since 2012, major pharmaceutical companies began to announce new policies on third party access to data from their clinical trials, with many erecting systems to streamline the process. In 2013, The BMJ co-founded the AllTrials campaign. The BMJ also reviewed its own policies following the launch of the open data campaign. In 2012, The BMJ announced that, for drug and medical device trials, they would “be considered for publication only if the authors commit to making the relevant anonymised patient level data available on reasonable request.” That policy was extended in 2015 to all clinical trials. In its rapid response, CDC and other public health agencies highlight the conclusions of observational studies over randomised controlled trials. 8 Dec 2009 Roche point-by-point response from Roche to BMJ questions (Letter). 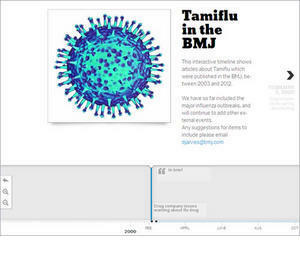 We have created an interactive timeline that shows articles about Tamiflu which were published in the BMJ, between 2003 and 2012. We have so far included the major influenza outbreaks, and will continue to add other external events.